I will have a chance to present my book at the upcoming PMI Frankfurt Chapter meeting on March 29, 2010 in Frankfurt. A preliminary version of the presentation is available at http://tinyurl.com/tjep-pmifc1003. Feedback is welcome and appreciated. My new book “Leadership Principles for Project Success” is about project success. And it reveals a secret for project success: effective project leadership. It shows where pure project management falls short and why project leadership is the decisive factor for project success. It outlines five simple yet powerful leadership principles which if applied systematically can help you pave the path to project success. This book explains these principles and illustrates how you can use them to set up, manage and align your projects for success. Last but not least it shows you how to become an effective project leader. They thus help secure project success. These 5 principles are not based on a particular theory or management concept. There is a vast amount of literature on project management, leadership, project success and related topics. This literature is important and valuable. Yet, I did not want to write a literature review on the various books on project leadership. While this, too, may be a valuable exercise, it was not my intention. Instead, I wanted to write a practical book which is based on my own personal experience in project management. I wanted to share my insights about project success and my philosophy of project leadership and how it contributes to project success. I was not interested in building complex theoretical models of project leadership. My aim was to develop a guideline for project leadership which can be applied in any kind of project. This is why the project examples I cite in the book come from all kinds of environments, professional and non-professional. They show that the principles are universal and independent of the nature of a project. One third of the book is reserved for practical samples showing the Leadership Principles in action. In addition, the Appendix contains practical and easy to use templates and guidelines you can immediately use in your projects. I am not in the position to claim that I have worked, managed or reviewed only successful projects. I have seen and experienced great projects where everything seemed to work. And I have been exposed to death march projects which were either doomed for failure from the very beginning, or things did not go well at all, where the work atmosphere was lousy, where there was no team and instead people were fighting rather than working together. This is not to say that this is normal. Indeed, I claim that most projects can be successful if set up and run correctly. The book will show you how. It starts with good and solid project management. It is the toolset of a project. As such it can serve as an excellent vehicle leveling the way to project success. It is not, however, sufficient. I have seen projects where the project manager was highly skilled in his or her discipline. All tools and templates were based on best practices. And yet the project failed or at least did not go as well as expected. Final project deliveries were good but the road to this delivery were filled with debris of long hours, low team morale and dissatisfied customers. For some time I, too, had thought that project management is the critical success factor of a project. Fortunately, I learned that there is much more to it. At the beginning of a project I managed earlier in my consulting career I gathered the complete project team. We wanted to discuss how to ensure project success from the very beginning. Doing so we talked about the hard facts which in this case was the successful integration of a call center software. Then we went beyond these hard factors. We talked about how we could delight the customer, how we could ensure high quality throughout the project, how we could learn from our mistakes during the project, how we could work smart and not hard, and, last but not least, how we could have fun as a team. We set out the project journey on a high note: we wanted to set a new standard for project success. Succeeded we did. The project was delivered on time and in budget. From this perspective many people would call the project a success no matter what. Analyzing the success we found out that it were actually the “softer” objectives which helped us deliver the project successfully. Project success was more than the sum of deliverables. The path to the final delivery mattered a great deal. And it was about us as the team. We worked together, shared our expertise and experience, grew together and had fun together. Alas, we were human and consequently we made mistakes along the way. What was different in this project was what we made out of our mistakes. We took them as learning opportunities. We wanted to deliver results and thus accepted mistakes as learning steps towards the ultimate delivery of the final product. It was a very rewarding experience. And it was insightful for it revealed the five principles I am laying out in this book. We started out the project with a common vision, we nurtured collaboration, we performed as individual experts and as a team helping each other, we cultivated learning, embracing mistakes as learning and growth opportunities, and finally we delivered results. Project management was an important and valuable element in project success. However, it was the vision, collaboration, performance, learning and results which made the key difference. They were and they are the principles for project success. Our project success was not a one-time phenomenon or happening at the end of the project. It was ongoing; it was a growth process for the duration of the complete project and culminated in the final delivery. On time, in budget, at a very high quality, and, last but not least, delighting the customer. Project success is like a journey to a final destination. Or you can compare it with an expedition or tour. Take the image of a mountain guide showing the path to the summit of a mountain. 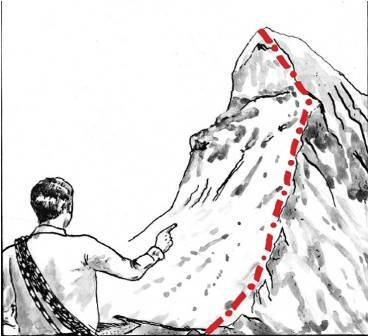 A mountain guide shows the path to the summit of a mountain. You can see the path in front of the guide. The planned route is marked on a map and maybe you can see it in the distance. In order to get to the summit you need to be in a good physical shape, carry the right tools with you. Depending how experienced you are you may need the help of others to reach the summit or offer your assistance to members of your mountain hike. If you have ever hiked a mountain you know that arriving at the summit is certainly the climax of your trip. But it is not the only thing that matters. The ascent to and descent from the summit are just as important. And just as joyful. Reaching the summit may be the driver of the mountain tour. If, however, this is the only thing you focus on chances are that you will fail along the way and never reach the summit. You are hiking through nature, you are exposed to the natural elements and have to react to changing environments. You may have a plan which has proven to be reliable in the past. There can be times though when you have to change your track. You may have to take a detour or decide to turn back to the base camp and try to reach the summit at a later time or maybe not at all. Good and experienced tour guides know this. They take on the responsibility for their whole group. They want the whole group to safely reach the summit and return to the base. It is not about the performance of individuals who may be highly skilled and experienced mountaineers. The mission is to reach the top together in one group and return home safely. This is why I picked a picture for the book cover of a group of people rather than a single individual reaching the summit of a mountain. A mountain tour is, just like a project, a team effort. It is misleading to define project success in a static term, focusing only on the final delivery. In the mountain tour example this would be reaching the summit. Project success is dynamic and covers the complete path from initiation to the final deliverable and project closure. Effective project leadership takes this into account. Just as the experienced mountain guide who plans the tour, takes a group of people to the summit, returns them home safely and who is committed to making the tour a joyful and safe experience. Project leadership and the principles of effective leadership are not limited to the role of the project manager or project leader. Indeed, as I will explain in the book you can apply the five principles of effective leadership in any role you fill on a project. May it be as the official project sponsor, project manager, team member, an external consultant, a project auditor or any other project role. Applying the leadership principles outlined in this book contributes to project success. Alas, by themselves they do not guarantee project success. It takes more than a single individual to secure project success. It takes a team. The question is how you can increase the chances that your project is moving into the right direction. The five leadership principles serve as a guideline to project success. It is up to you to apply them in your role and thus make a difference. It is a question of leadership. And I am claiming that you too can apply the leadership principles, practice leadership in your role and thus contribute to project success. It may be difficult at times. But it is possible. And every journey, regardless how long it may be, starts with the first step. Take this step and move forward. May this book serve as a companion on your journey to project success. I wish you a happy and prosperous journey.